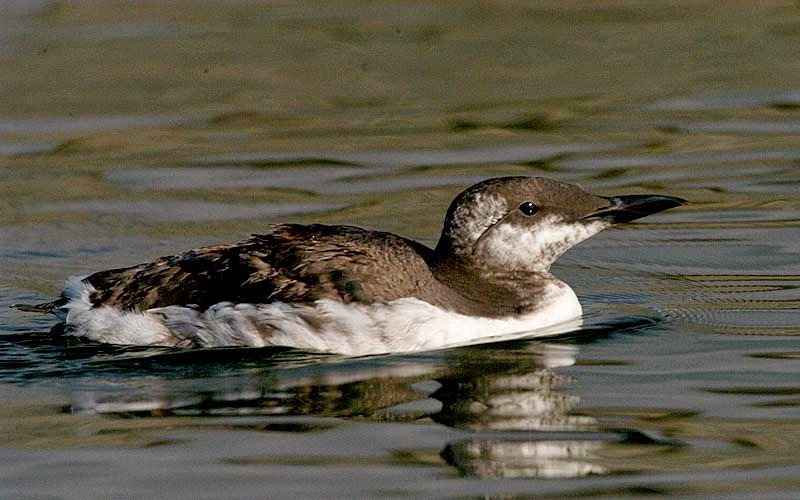 Hi birders, a Yellow-billed Loon and three Western Grebes were seen on the Strait of Georgia off the Plummer Road side of the Englishman River Estuary in Parksville. Common Mergansers, Red-breasted Mergansers, Pacific Loons, Common Loons and Common Murre's were seen off shore. Several flocks of Surf Scoters were heading up and down the Strait of Georgia. A large flock of Pine Siskins flew over and landed in a tall tree, giving us great views. A flock of Bushtits joined the Siskins in feeding on the tree. 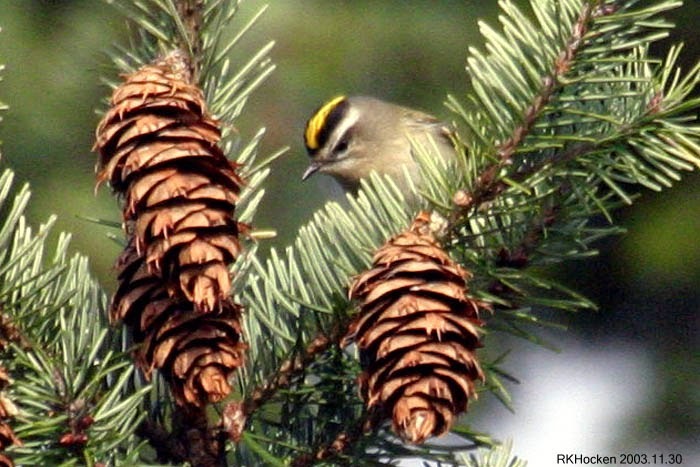 The Tuesday bird walk on February 03, 2015 will be going to Rathtrevor Park in Parksville. The Sunday bird walk went to the Bowen Park in Nanaimo. The morning was partly cloudy with sunny periods, making for a pleasant walk in the woods. 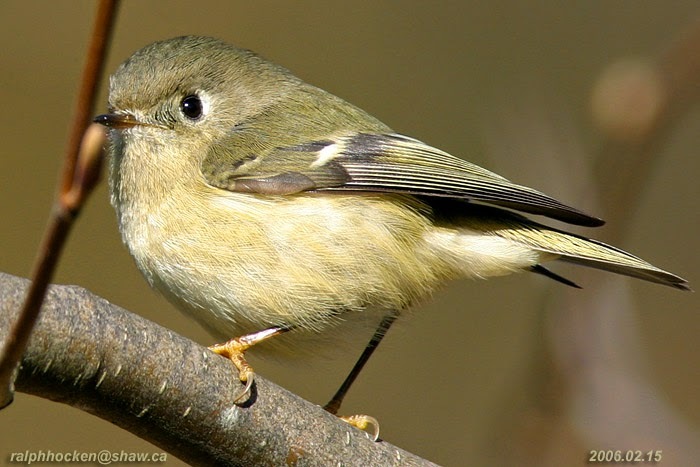 We spotted Ruby-crowned Kinglets and Golden-crowned Kinglets high in the trees. We heard several Pacific Wrens singing throughout the morning. A Merlin was perched at the top of a tall snag. An American Dipper was bobbing on the large rocks in the salmon stream. 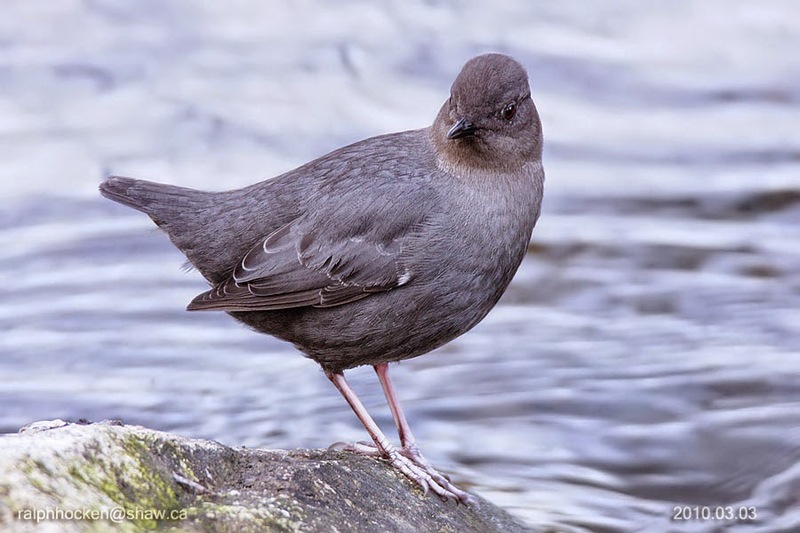 American Dipper; Ralph Hocken Photo. The Tuesday bird walk went to the Plummer Road side of the Englishman River Estuary in Parksville. The morning was cloudy with calm winds and calm water on the Strait of Georgia. The highlights of the morning included seeing three Gadwall near the mud flats. 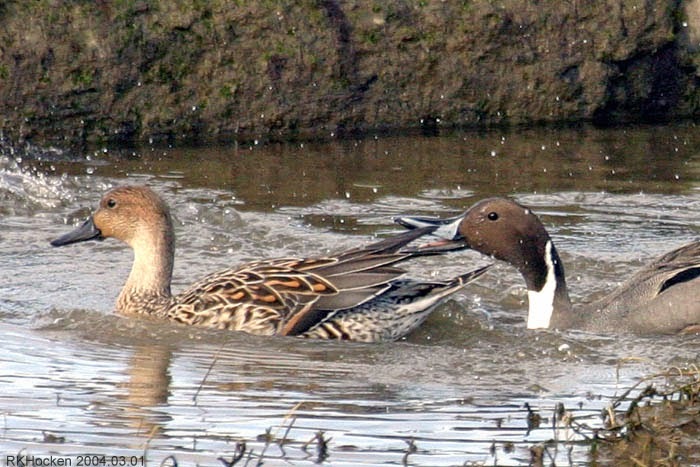 American Wigeon, Mallards, Northern Pintails and Green-winged Teal were also feeding on the mud flats. Thousands of Mew Gulls, Thayer's Gulls and Glaucous-winged Gulls were resting behind the mudflats and lifted in a huge cloud as a Bald Eagle flew over. The gulls landed close by giving us all lots of time to study the different gulls at close range. A large flock of over sixty Brant Geese flew close to shore heading down the strait. 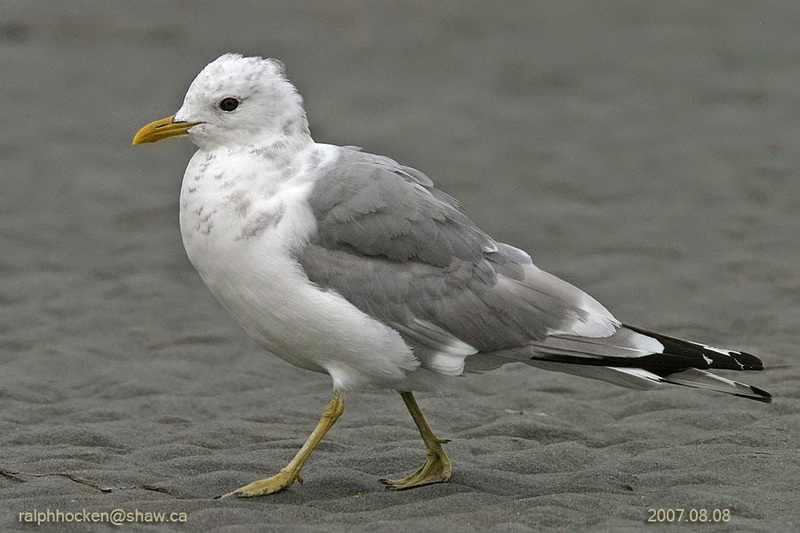 Mew Gull: Ralph Hocken Photo. An American Pipit was seen in a backyard along Haida Way in the Seacrest neighborhood of Nanoose Bay. A Turkey Vulture flew over a large flock of about two hundred very noisy Surfbirds and one Black Turnstone as they were feeding near high tide at Pipers Lagoon Park in Nanaimo. 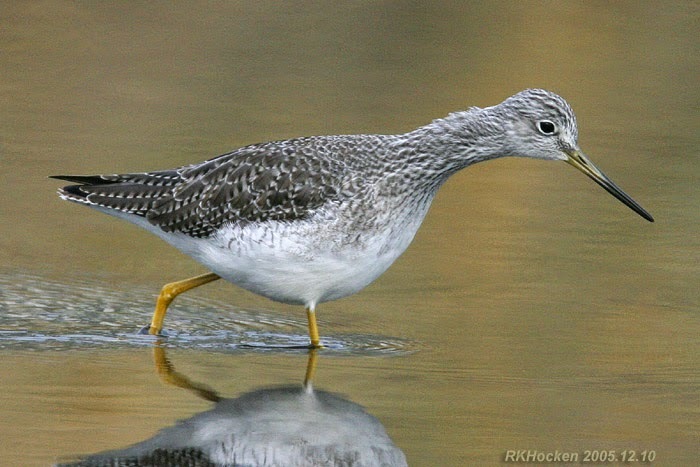 One hundred Dunlin and one Black-bellied Plover were seen roosting offshore on Shack Islands across from Pipers Lagoon. Hooded Merganser, Bufflehead, Mallards, Ring-necked Duck, Double-crested Cormorant, Red winged Blackbirds, Dark-eyed Junco, Chestnut -backed Chickadee, Song Sparrow, Golden- crown Sparrow, Bewick’s Wren, Spotted Towhees, American Robins, Northern Flickers, Steller’s Jay and a Bald Eagle were seen at Diver Lake in Nanaimo. Common Mergansers, Harlequin Ducks and Black Turnstones and over one hundred Sea Lions were hanging out off the point by the parking lot at Neck Point Park in Nanaimo. at the parking lot near the Lions Club Playground in Parksville Community Park at 9:00 a.m. or at the end of Shelly Road off the Oceanside of highway 19a at about 9:10 a.m. 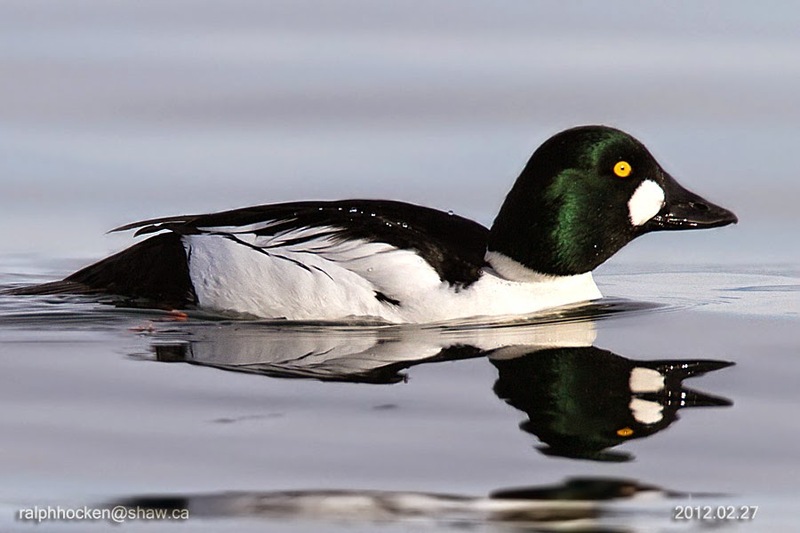 The Sunday bird walk on February 01, 2015 will be going to Nanoose Bay. Meet at the Bird Store at 9:00 a.m. or at the beach near the Church Camp off Highway 19 and Arlington Road at about 9:15 a.m. The Tuesday bird walk went to the Plummer Road side of the Englishman River Estuary in Parksville. The morning was cloudy with calm winds and calm water on the Strait of Georgia. The highlights of the morning included seeing three Gadwall near the mud flats. Thayer's Gulls and Glaucous-winged Gulls were resting behind the mudflats and lifted in a huge cloud as a Bald Eagle flew over. The gulls landed close by giving us all lots of time to study the different gulls at close range. 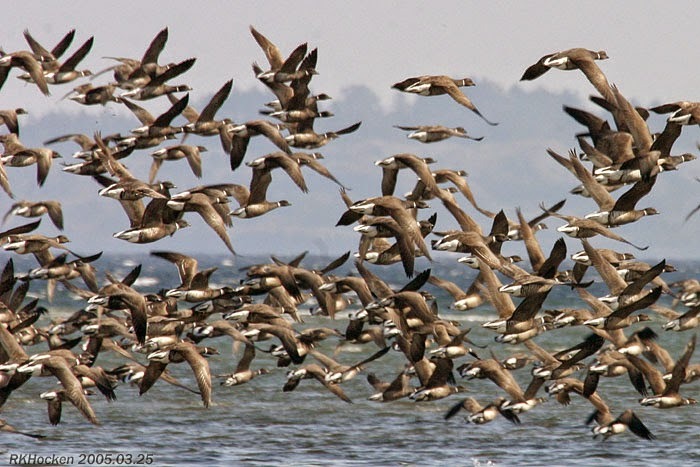 A large flock of over sixty Brant Geese flew close to shore heading down the strait . Brant in flight: Ralph Hocken Photo. 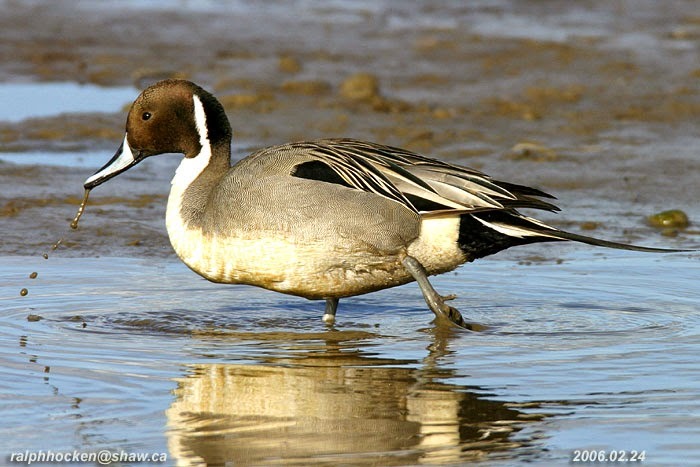 The Tuesday bird walk on January 27 will be going to the Shelly Road side of the Englishman River Estuary in Parksville. There were three Killer Whales ( Orcas) heading up the strait. A Peregrine Falcon was spotted at top of a tall conifer overlooking the marshland at the Little Qualicum River Estuary north of Qualicum Beach. White Hummingbird: Friend of Dauna’s Photo. The Tuesday bird walk went to Columbia Beach. The morning was cloudy with calm winds and a smooth Strait of Georgia. The highlight sighting of the morning was the exciting showing of a pod of four Killer Whales heading up the Strait near the far horizon. Killer Whales or Orcas are the largest of the dolphins and one of the world's most powerful predators. They feast on marine mammals such as seals, sea lions and also on fish, squid, and seabirds. Watching the whales blow as they travelled along the horizon and then dove below the surface, only to rise again in a few moments was awesome!!! Golden-crowned Sparrows, Dark-eyed Juncos and Pine Siskins. Thirty California Quail were seen feeding in a backyard in the 3000 block of Barrington Road in Nanaimo. The Snow Goose and two Greater White-fronted Geese are still feeding on the grass at the Parksville Community Park in Parksville. Arrowsmith Naturalists meet at Knox United Church in Parksville at 7.30 pm. Members Night when members share their photos. All welcome. The Sunday bird walk on January 25, 2015 will be going to Bowen Park in Nanaimo. Meet at the Bird Store at 9:00 a.m. or at the main parking lot at Bowen Park(near the lawn bowling green) off Bowen Road at about 9:15 a.m.